As a supplier of High Quality Silicone Wire, we have to talk about the difference between the braid of wires and cables. To begin with, the part of the fiber: For the cable, a fiber is a form of its lightweight protective coating.Its principal function is to protect the insulation from all kinds of heat, light, and moisture. Erosion of reduced temperatures, acid and alkali gas, and damage from external mechanical forces ensure the safe operation of the Acids Resistant Cable. For wires, the fiber woven coating is often at the middle of the sheath to enhance the tear strength of the sheath. By way of example, the reinforced jacket is to include cotton yarn, hemp, and another fiber is woven layers at the middle of the rubber or plastic sheath to improve The strength of this sheath. 1. Shielding effect against electromagnetic interference, such as tinned copper wire braided blue cable, copper wire braided control cable. 2. 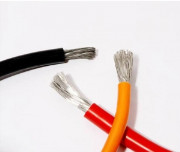 Remove the shielding effect of the surface potential of the electrical cable. It binds the power line and eliminates inductive power, like the total shielding of high voltage wires. （1） Mechanical protection. Such as marine power cable CF31 type. （2）It is subject to longitudinal tensile breaking force, such as magnetic measuring cable WC-GC and WCT for marine geological exploration.